The T.T. 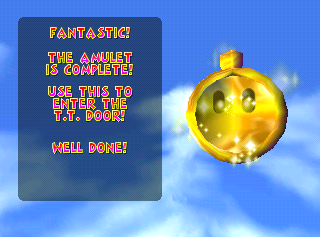 Amulet is a type of item in Diddy Kong Racing and its Nintendo DS remake, Diddy Kong Racing DS. It was originally split into four pieces, with each piece being a reward for completing a Challenge Level. The criteria was changed in the DS remake, where the player races against T.T. in a Wish Race. The T.T. Amulet's purpose is to unlock the T.T. Door in Future Fun Land, which leads to the second and final race against Wizpig. The player must also have every Golden Balloon to enter. Complete T.T. Amulet icon from the pause screen of Diddy Kong Racing DS. The player obtains the first T.T. Amulet piece in Diddy Kong Racing DS. This page was last edited on December 26, 2018, at 10:15.